I could write a book with all the stories of patients that God has brought to our door – and maybe someday I will . . . but for now I want to highlight a few more people that we have been able to assist. Through my phone calls and dealings with Koliwo I was introduced to “the best doctors and surgeons in Liberia”. Those relationships have served me well in assisting others to get the care they need. Mardia is a beautiful young lady that has suffered from Pelvic Inflammatory Disease causing her to drop out of nursing school several times in the last 2 years. She is house helper's (Musu's) niece and they asked if I would be willing to assist her. When I first met her she was having severe abdominal pain and we arranged for a surgical consult where they determined that she needed surgery to remove a large Ovarian Cyst. She and her family didn’t have the money, $400, to pay for it. Thanks to some very generous year-end donations we felt like we could assist her and pay for the surgery. This was a huge relief to Mardia and her family and it is a great joy to see her feeling healthy for the first time in years and being able to attend nursing school where she will hopefully one day be able to show God’s love to others who are hurting. Jon is Musu’s nephew and was last seen during the war when he was just 9 years old. His parents both died and he was presumed dead by the extended family. As you can see from the picture he is blind in his left eye – a result of shrapnel from a bomb. He arrived in town last week, much to the joy of his family. But he was very sick. Musu spent the night with him thinking he was dying. When he got to me he was very short of breath and I was quite concerned for him. 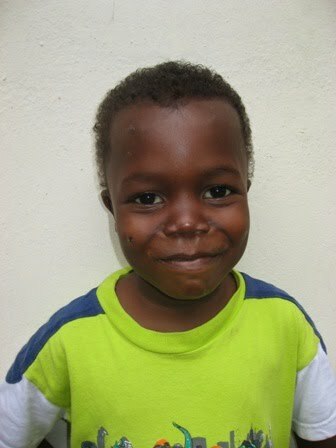 Moses went with him to the clinic and they determined that he had pneumonia and malaria. He was given medications and told to come back in a few days time. Upon his return visit, they decided that he may have TB. After sending him to the TB clinic at JFK Hospital and doing CXR and checking his sputum he was diagnosed with TB. We have gotten him housed in a TB Annex that was built by the UN and houses almost 200 patients. 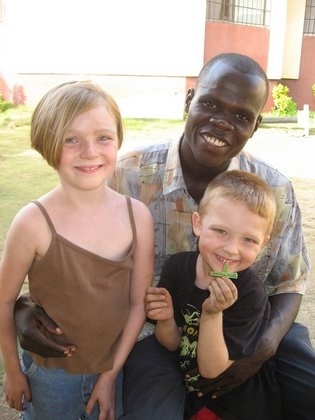 It is just down the road from our house and we thank God that John found Musu and that we were able to assist him in getting the treatment he needed. Bobbie is a 25 year old young man that lives just right outside our compound walls in a small “shack” with three other people. He came to us several months ago complaining of a sore on his foot that was draining pus. He was treating it by putting a small stone on top of it – he told me it would help draw out the pus. His foot was quite swollen and he was unable to put weight on it. Kreig took him to the Emergency Room at ELWA Hospital where they gave him a shot of antibiotic. When he returned from the hospital he told me they had told him to wash it himself and then put a bandage on. I told him I’d do dressing changes twice a day. Bobbie would come in the morning and in the evening and we would soak his foot in warm soapy water and then I would milk out the pus. After several days we started to see a noticeable difference and he was so grateful for something as simple as having his foot washed twice a day. But when you live without running water and electricity warm water is a luxury. Last week we were awakened by a phone call at 0400 from another boy, Alex (bottom of the picture), that lives in the shack next to Bobbie. We had just assisted his father (sitting down in back row of picture) in having a hernia repair and so we were concerned that he was having post-operative complications. Alex was talking quickly saying, “he’s dying, he’s dying”. Kreig quickly put on clothes and got his head light and found the guard to let him out of our walled compound. When he arrived he saw Bobbie sitting on the ground with weakness on his left side, unable to speak and drooling. He thought maybe he’d had a stroke. He came back to give me a brief report, got money and his keys and drove Bobby to the Emergency Room at Catholic Hospital. We were encouraged by the fact that Bobby was able to walk with assistance to the car – but the big question was what was wrong? At the Emergency Room they tested him for malaria and gave him a steroid in case he was suffering from a head injury since his friends said that he had fallen two days earlier hitting his head. His blood work showed that he had cerebral malaria that was causing partial seizures. His malaria treatment finished two days ago and he greeted us with a huge smile as we left the house yelling, “my body is strong again! Look, my body is strong!” He was so grateful and we thank God that we were in a place that we were able to assist him again. We felt honored that they knew they could call in the middle of the night. His family wanted him to use “country medicine” – which is basically seeing a witch doctor. If he had taken this treatment, instead of traditional medicine, he would probably not be alive today! Quita Momoh is the younger sister to Moses. During the war Moses was separated from his family and presumed them all to be dead. Just this year he was reunited with his family but grieved when he learned of his sisters hearing problem. He said, “Mommy, she can’t hear me when I talk to her. She only hears small, small, when I speak with a low voice.” While she was pregnant with her youngest daughter she got malaria and was given quinine injections for treatment. While receiving the medicine she experienced ringing in her ears and then she was unable to hear clearly – just a constant loud noise like an airplane going overhead. She longs to hear her three living children speak to her but finds it difficult as she is only able to hear low tones. When she arrived at our house she had her youngest daughter, Fatamata, on her back. She said that she had also brought her other two children when she traveled from her small village in “the bush.” She apologized for not bring them to our house but she explained that they didn’t have shoes to wear and so she left them at her cousins room in town. She said if she was able to get some “slippers” (flip flops costing 50 cents) then she would bring them to meet us. She came asking if we could help her to see a doctor that may help her to hear again. What does one do when faced with yet another problem that seems so hopeless in this country? Well, I phoned several doctor friends in town to see if there were any resources I didn’t know about and also called my good friend, Becky, in California for an ear consultation. We’re hoping that we can get some good diagnostic hearing assessments done at a new hearing clinic in town and then possibly get some hearing aids donated. Quita walked out of the gate with a huge smile on her face and hope renewed. She left with money to buy “slippers” for her children and to see the doctor at the hearing center. Now we will wait to see what is next for Quita – we hope that someday she will be able to hear and understand the sweet voices of her children! And then there is Zinneh, he was a day worker on the ship and greatly loved by the crew on board the Africa Mercy. Shortly before the ship sailed he was diagnosed with Leukemia and was told that there is no cure or treatment in this country – it will take his life, unless God chooses to do a miracle. The Africa Mercy Crew took an offering, that they have asked me to manage, in order to assist Zinneh’s family with his medical expenses and possible funeral expenses. Whatever is left will assist them in a cement business that will hopefully sustain them. My friend, Kristen Chapman, and I will be visiting him together. We don’t know what the future hold but we do know that we will walk the road ahead with Zinneh and his family. Please pray for all of us as we anticipate some very difficult days ahead. 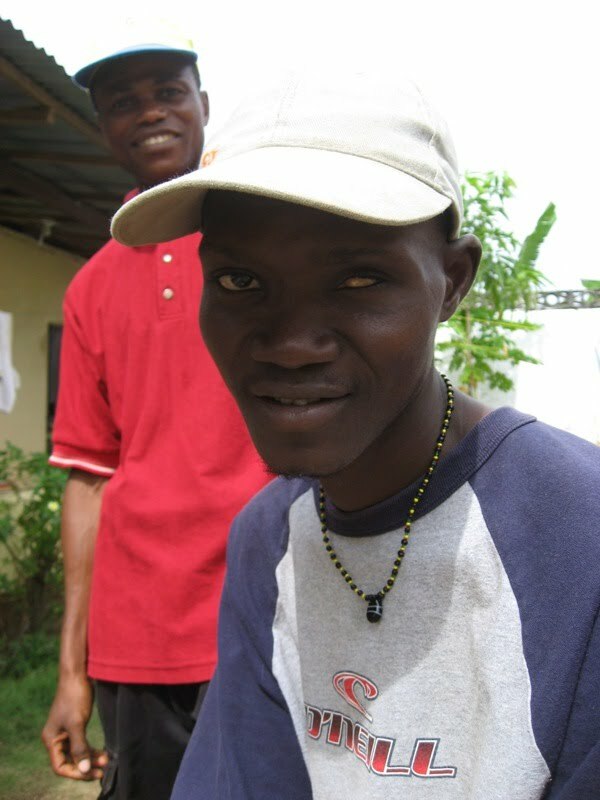 There is no hospice in Liberia and narcotics are scarce – so we just pray that he doesn’t suffer needlessly. I write to you about all these situations to say thank you to those who have been partnering with us through prayer and finances. No one knows what tomorrow will bring, but in my case, I’m ready for my next patient. I have been amazed by the variety of people that God has brought to our door and how much work I have done as a nurse since the ship sailed. I am enjoying the opportunities to assist the sick and to pay for care that I know they would be unable to get on their own. Kreig has been a great partner in this work as well as Moses – another former patient that was pictured in our last email where I was teaching him to read. Moses has a real heart of compassion for the sick and often accompanies people to doctor’s visits when I am unable – it is an all day affair here in Liberia. If any of you are interested in “sponsoring” a sick person or “sponsoring” a child to go to school – please let us know (Click here to see how to contact us). The needs are greater than we can do alone and at the rate we are going we will have no savings when we return to California. But when we know there is some money in the bank we don’t feel like we can turn away a sick person in need knowing that in most cases we are their last option for assistance. God has been faithful to provide enough each month . . . so for that we’re grateful. As you can see life has not gone according to our plans but each day God shows us small reasons why we are in Liberia during this season. We are trying to make the most of it and know we will miss Africa upon returning to the USA. But, at the same time, we look forward with great anticipation to the day when we can embrace our parents and siblings, meet our niece, see our friends and watch our children enjoy being spoiled by their grandparents who they haven’t seen for almost 3 years. Please pray that God will give us the grace and joy needed as we live here in Liberia. We will certainly never forget these days or how fortunate we are to have the many “comforts of life” that we so easily take for granted! Thank you for your partnership and support of our family. When people come to us and say how grateful they are for our assistance we always tell them to thank God first because we didn’t plan to be here and then we also tell them about all of our supporters back home that are assisting us so that we can assist them!